The acquisition of Piedmont Natural Gas is a big move into natural gas, but it comes at a steep price. When an electric utility like Duke Energy (NYSE:DUK) starts to see its business come under fire by falling demand and competing energy sources, it's natural to want to diversify and expand to grow your competitive moat. Yesterday, Duke Energy decided that expansion should take place in natural gas distribution with the $4.9 billion acquisition of Piedmont Natural Gas (NYSE:PNY) and its 1 million natural gas customers. This will ease some of the pressure on Duke Energy's electricity business and provide some earnings stability. It'll also expand the reach of the country's largest utility. Duke Energy has agreed to pay $60 in cash per share for Piedmont Natural Gas, a 40% premium from Friday's closing price, along with assuming $1.8 billion in net debt. To pay for the acquisition, Duke Energy will sell $500 million to $750 million of new stock as well as cash from other unnamed sources. Given the complexity and regulatory approvals needed, the deal won't likely close until late in 2016. Once the deal does close, Piedmont is expected to operate as a separate subsidiary of Duke Energy. 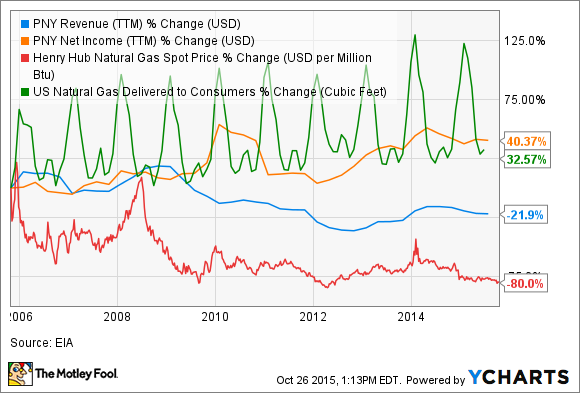 Why natural gas, why now? The move into natural gas is easy to justify for regulated electric utilities. Instead of slow demand growth and threats from new entrants like rooftop solar and energy storage, natural gas is enjoying low costs and booming demand. You can see below that consumer natural gas consumption is on a decade-long rise, and over that same time, Piedmont's profit has been on a steady incline as well. PNY Revenue (TTM) data by YCharts. Duke Energy is only predicting 1% demand growth over the next 15 years, which could result in declining earnings as competition creeps into the electricity market. I guess management sees natural gas as a way to offset this downtrend in electricity. A bigger power in the Southeastern U.S. This isn't Duke Energy's first move into natural gas. At the end of 2014, it had 500,000 retail natural gas customers in southwestern Ohio and northern Kentucky. Adding 1 million natural gas customers in its home base of North Carolina and the surrounding states will give the business diversification and expand the company's reach within a small geographic territory. After combining Duke Energy's natural gas business with Piedmont, there could also be cost savings from the larger operation. With one large move, Duke Energy is saying it needs to be more than just an electricity supplier in the Southeastern U.S., it needs to expand into natural gas distribution as well. That's a defensive move, but long term, it will give the company a more diverse revenue base and provide a growth business next to a tumultuous electricity business. $4.9 billion is a steep price tag for the $142.2 million in net income Piedmont Natural Gas made in the last year, but it's a strategic move Duke Energy thinks it needs to make. I think adapting to new sources of energy would be a better use of money, but we'll see over the next few years if Duke Energy can turn this into a profitable growth opportunity or not.